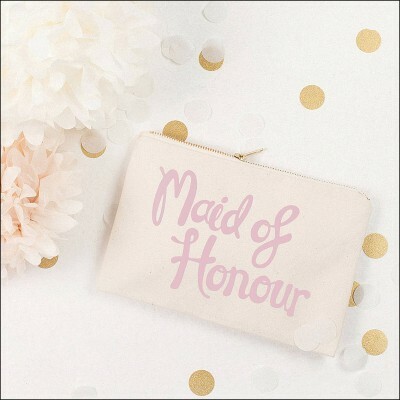 maid of honour pouch - rose by Alphabet Wedding Bags | Wedding Shoes by Alphabet Wedding Bags | Bridal Shoes by Alphabet Wedding Bags from Arabesque. The ideal accessory for your lovely maid of honour. Fill with little gifts and let her carry out her duties in style. This little pouch is ideal for carrying wedding day essentials and makes a lovely keepsake for when the big day is over. The design has been printed in rose pink on soft natural canvas with a natural cotton lining. Lovingly stitched and printed in the UK, complete with a heavy-duty gold colour zip.